For the second part of my two-part article on Mosel Kabinett, I also interviewed a number of top producers to hear more about this misunderstood Prädikat. Stefan Steinmetz of Günther Steinmetz likes to produce a Riesling Kabinett feinherb from parcels near the top of the famous Brauneberger Juffer. His family's plots for this off-dry Kabinett are steep and close to the trees that shield the vineyard from the northerly winds. The soil in this upper section, which is somewhat cooler, has lots of slate but is more prone to drought. The Kabinett feinherb, mostly from 20-year-old vines, has finesse and a marked mineral taste. In the 2010 vintage, for example, the wine had close to 30 grams of residual sugar. Carl von Schubert at Maximin Grünhaus explains that residual-sugar levels for Riesling Kabinett have significantly jumped since the 1970s and 1980s from about 20 to 30 grams of residual sugar to 60 or more grams per liter. Of course, Carl is only referring to the fruity-sweet Kabinetts, not those labeled as halbtrocken or feinherb. In 2010, Carl decided to stop labeling a Maximin Grünhäuser Abtsberg and Herrenberg Riesling Kabinett trocken. Instead, he chose to follow the VDP's lead, as many other nonmembers in recent years, by leaving off the Prädikats—Kabinett, Spätlese, and Auslese—for all the dry Rieslings. Like Steinmetz, the only exception at Grünhaus is their Kabinett feinherb, which is from Herrenberg (deeper, more red-colored soil) and sells well in Germany. Moreover, this wine is actually closer to the residual-sugar level of their fruity Kabinetts of the 1970s and 1980s, even though the must weight is higher. Up until 2004, Grünhaus also employed 10-hl pressure tanks, which gave the wines an added spritz and reductive stink. The estate also had more oak Fuder casks. Maximin Grünhaus started to bottle their dry-tasting Rieslings with a Prädikat in the late 1970s. Before then, certain batches of wine might have fermented dry, but were only noted by their AP number and, before 1971, by a tank or cask number. Carl says that he had to convince his father, who favored sweet wines in this period, to bottle a wine labeled Kabinett trocken in 1979. The first Kabinett halbtrocken from Herrenberg was a 1980 vintage. Even so, their fruity Kabinetts were usually just above the legally designated halbtrocken, at about 20 to 25 grams of sugar per liter. Pre-1971, the chaptalized (verbesserte) wines of the 1960s had on average no more than 15 to 20 grams of sugar per liter, the Naturweine a little more. Once again, the style of wine at Grünhaus and other properties in the heyday of the late 19th century was certainly different from the 1960s and 1970s. Carl was also an early proponent of the revival of dry Rieslings in the greater Mosel region. Carl's friend and colleague Ulli Stein of Weingut Stein, likes to make from his old vines in the stony blue and gray slate of St. Aldegunder Himmelreich both a Riesling Kabinett trocken and feinherb. From an east-facing site with ungrafted, old vines—some up to 100 years old—the grapes fully ripen at lower must weights than modern clones do and are therefore ideal for Kabinett-designated Rieslings. He doesn't want to make a fruity Kabinett, much less a Spätlese, but rather a true dry-tasting Mosel Kabinett, as he sees it. 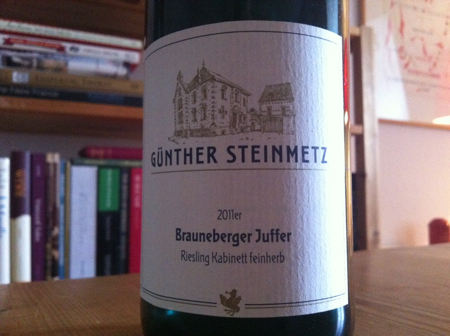 Besides his excellent St. Aldegunder Himmelreich Kabinett feinherb, he also makes a Kabinett trocken. For the latter, Ulli also seeks to get it under 10 percent alcohol. In order to do this, though, he typically does two pickings and then assembles them afterward, one so that he can guarantee the low-enough must weight and the other to guarantee ripe-enough flavors. He says Kabinett should be delicate and light, like a "ballerina." Unlike Maximin Grünhaus and other estates, Ulli prefers to keep—for now, at least—the term "Kabinett" to indicate certain light-bodied trocken and feinherb Riesling. The lightly chaptalized wines, mostly herb, which translates to "bitter." (In this instance, it means dry.) His father's wines were rarely sweet, he says, and always light. The naturreinen Weine, or "naturally pure wines," which corresponds to Kabinett—i.e., no chaptalization, Oechsle between 70 and 80 degrees, mostly dry, rarely sweet. Spätlese, from between 85 and 90 degrees Oechsle, often dry, one-third sweet. With the 1971 Wine Law, the Steins began using the Prädikat Kabinett, along with the 1971 terms trocken and halbtrocken. But the style of wines stayed the same with 70 percent dry, 20 percent off-dry, and 10 percent sweet wines. Up to 75 degrees Oechsle would be chaptalized. Above this must weight, they produced dry and off-dry Kabinetts. And at about 90 degrees Oechlse, they made Spätlese wines. Ulli says that their Kabinetts, in general, were seldom sweet, mostly off-dry, with between 8.5 to 9.5 percent alcohol. These wines, tasted today, are still drinking well and "represent the delicate, light Mosel Rieslings." The family property of Peter Lauer in Ayl no longer produces a Kabinett, regardless of sweet, lightly sweet, or not sweet. According to winemaker Florian Lauer, the Riesling grapes are nowadays too ripe for this Prädikat, even in the cooler Saar region.† "In the past, Kabinetts had much lower must weights," says Florian Lauer's father, Peter (II). He adds that the 1987 vintage was the last year before ripeness levels began to increase. Before 1971, Peter Lauer's unchaptalized, low-alcohol, dry Saar Rieslings had the words Original-Kellerabzug, or estate-bottled, and naturrein. For Peter Lauer, the key word in defining Kabinett is "light." He feels that this style of very light, dry Riesling is a wine of the past and that clients for dry Kabinetts are slowly dying out. The modern taste is for riper, dry-tasting wines. Over a period of time, the Lauers always made dry as well as sweet Saar Rieslings. Peter Lauer says that before the advent of modern cellar techniques—in particular, sterile filtration—in the 1950s and 1960s, it was not possible to make sweet wines in the style of today. The key was to remove the yeasts from the wine via filtering. "Sulfuring wasn't enough," he says. "Spätlese used to be 76 Oechsle," Peter says. Today, the legal minimum ripeness level is 80 degrees Oechsle, which is still quite low. Most quality producers harvest the majority of their Riesling grapes in the mid-80s to low 90s. A typical delicate "Möselchen" ("little Mosel") at Lauer had 9.5 to 10 percent alcohol with anywhere from 6 to 10 grams of sugar per liter. Peter points out, too, that many estates, unfortunately, made their sweet Prädikat Rieslings with Süssreserve, or sweet reserve, a practice frowned upon by most quality-oriented growers. Today, the Lauers make some alcoholically light Rieslings that are labeled differently. Instead of using Kabinett trocken/feinherb, they just write, for example, "Ayler Riesling" with a specific Fass, or cask, number, even if the wine in question was most likely in a fiberglass or stainless-steel tank. At the cult family property of Willi Schaefer in Graach, they bottled before the 1971 Wine Law various Fuder casks of Naturweine, comparable to Kabinetts. These were most often off-dry, though some casks fermented dry, while others had a little more residual sugar. In general, Willi Schaefer says that the wines had residual sugar somewhere between 10 and 20 grams per liter. Much depended on the vintage of course. In addition, their underground cellar—like many old cellars in the Mosel region—remains cool, with some areas cooler than others, and therefore certain casks of Riesling ended up having a little more leftover sugar. These were often the most prized wines. Willi Schafer also says that the cool cellar, low pH, and high acidity, all help to make for fresh, stable Mosel Rieslings. In addition, he doesn't need a lot of sulfur to protect the wine, unlike in other regions with higher pH values and lower acidity. In the 1970s, he says that the fruity Kabinetts had between 30 and 40 grams sugar. Nowadays, their Kabinetts from both Graacher Himmelreich and Domprobst, are about 45 grams plus. Willi Schaefer always made dry and off-dry Mosel Rieslings. He says that these are versatile and often consumed at his home. He began adding the terms "trocken" and "halbtrocken" in the mid- to late 1970s for his Prädikat wines. When we spoke, he recently enjoyed a bottle of his 1980 Auslese trocken. Nonetheless, the Schaefers specialize in making delicate, fruity and nobly sweet wines. Today, Willi Schaefer's light, dry to off-dry Rieslings are now sold as Qualitätswein, with neither a Prädikat nor a vineyard name. This is following the VDP classification. Their high-end dry Riesling is labeled GG and always comes from Himmelreich. Gernot Kollmann, the winemaker at Immich-Batterieberg, avoids Prädikats except for a traditionally noble sweet Auslese. He, however, designates the "basic" C.A.I. (Carl August Immich) Riesling—depending on the vintage, dry or off-dry—as a "Kabinett" in order to justify a higher entry-level price, as well as to highlight a light, unchaptalized, and a dry or near-dry Mosel Riesling. This harkens back to the original style of Naturwein, which Kabinett replaced in 1971. Erich Weber of Hofgut Falkenstein, a throwback producer of primarily dry-tasting Saar Rieslings, has not bottled a Kabinett trocken for a few years now, despite making various light, tangy Riesling Spätlese trocken and feinherb wines. He refuses to bottle a wine as Kabinett unless it tastes like one. Even his sweet Auslese wines taste like other growers' Kabinetts. The residual sugar of 30 to 50 grams is quite moderate for an Auslese. By contrast, Hanno Zilliken of the excellent Forstmeister Geltz Zilliken, for example, has bottled Kabinetts with over 60 grams of sugar per liter. Clemens Busch stopped labeling a "Kabinett trocken" from Pündericher Marienburg, because the site was declared an Erste Lage (now Grosse Lage) when his estate became a member of the VDP, which initially wanted to keep Kabinett only for their members' sweet wines. As a result, Clemens chose to label his dry Kabinett as a basic Gutsriesling trocken with neither a vineyard name nor a Prädikat. The grapes come from the upper steep section of Marienburg, above Fahrlay and in the direction of the castle. It's now labeled a Qualitätswein, which means it can be chaptalized, unlike a Prädikatswein. The VDP's Grosses Gewächs (GG) is oddly a Qualitätswein, too. Nonetheless, it remains unclear under the proposed restrictions how a VDP member can call attention to the fact that their dry, non-GG Riesling is unchaptalized, light, and most important from a specific site. Not all of these dry or off-dry Rieslings are basic and from outlying or lesser vineyard sites. Christoph Tyrell of the famed Karthäuserhof renamed their Karthäuserhofberger Riesling Kabinett trocken and feinherb bottlings Schieferkristall. Schiefer means slate, and Kristall is crystal. Christoph says that he wanted a wine that reflects the slate and remains light, mineral, and transparent; thus the wordplay. As the Karthäuserhofberg is a Monopollage, or monopole site, and rated Grosse Lage, he had no choice but to downgrade his non-GG dry Ruwer Rieslings with names like Schieferkristall and "Alte Reben," meaning "old vines." The latter is the former Spätlese trocken. (Beginning with the 2008 vintage, Carl von Schubert followed suit and renamed the former Grünhäuser "Spätlese trocken" wines Alte Reben trocken, too.) Christoph, however, bottled a special wine in 2012 listed as Spätlese trocken. It's called 2011 Tyrell's Edition, as he thumbs his nose at the new VDP requirements. Apropos VDP, Dönnhoff, in the Nahe, stopped labeling their single-vineyard Kabinett trocken as Oberhäuser Leistenberg. It's Tonschiefer Riesling trocken now. Tonschiefer refers to the weathered clayey gray slate soil of Leistenberg. The 2006 vintage was called Grey Slate Riesling trocken in some markets. Although the Pfalz tends to produce more full-bodied wines than the Mosel, a couple of VDP members still want to keep the Kabinett designation for their dry Rieslings. For example, Anna-Barbara Acham of Acham-Magin specializes in a refreshing, light Riesling Kabinett trocken from some of the best sites of Forst, Deidesheim, and Ruppertsberg in the Mittelhaardt. Because these sites are Grosse Lage, the wines should only carry the single-vineyard name for the GGs. Update: VDP members can only bottle a wine as Kabinett between 18 and 65 grams of sugar per liter. †In the 2012 vintage and as a new member of the VDP, Peter Lauer decided to make a fruity Kabinett, which has the VDP's upper limit of 65 grams of sugar per liter. I was given access to the quote above by a Rheingau grower whom I promised anonymity. David: Thanks for replying. As for Koehler-Ruprecht, I wasn’t considering the Saumagen Riesling Spätlese halbtrocken wines in my example, but I forgot all about the R and RR bottlings of Spätlese and Auslese trocken, which mature longer in bottle. I didn’t know about the Rheingau issues. Thank you for the excellent pair of articles. It’s been a busy holiday season here, and I just got around to reading them both this evening. Generally, I’m with David in that I find the term ‘Kabinett’ a useful descriptor for lower-alcohol, lighter-bodied Rieslings. Veering somewhat off-topic to the Pfalz, but in response to another issue that you mentioned: wasn’t Kallstadter Saumagen once the name of a Grosslage? If so, how did the current Saumagen site end up with that name, and what was its name before that? Was the vineyard named Saumagen before the 1971 law came into being? Thank you, Andrew. Perhaps Gernot Kollmann of Immich-Batterieberg will reply to the article, too. He agrees with you and David. It seems, however, that the VDP only wants to keep the term for light, sweet Rieslings. As for Saumagen, I don’t know. Maybe someone can help me with that? The Saumagen was briefly the name of a 50 ha Großlage around Kallstadt. It covered the vineyards Horn, Nill, and Kirchenstück -that last not to be confused with the excellent vineyard of Forst. As you are certainly aware, famous (formerly) single-vineyard names were appropriated for Großlage use in the 1971 German wine law and Saumagen is not alone in that distinction (the Deidesheimer Höfstuck is another good Mittelhaardt example). The Saumagen gets its name from the shape of the vineyard. A Saumagen is literally ‘Sow- Stomach’ (incidentally, Saumagen is also the name of the most famous regional food specialty in the Pfalz –a pigs stomach casing filled with meat, potatoes, onions, chestnuts, and spices. Delicious, btw). If you have never seen a pig’s stomach, it is roughly the shape of a kidney bean, but about the size of a football. The vineyard is steep, bowl-shaped, the slopes are south and east facing. It is made primarily of limestone, chalk and marl (but also loess and loam at the bottom.) When you see it, the first thing you think of is how amazing the exposition is for wine-growing on the slope and how horrible a frost-sink it must be at the bottom. One of these techniques is to wrap the fruit-bearing shoots around the top trellis-wire when they reach a certain length (instead of ‘hedging’ or cutting the shoot tips off). What we have seen happen is far less lateral-shoot building by the vine which means less leaf area -good for airflow and also to limit photosynthesis. This must be done at the correct stage of development (often two or three times in fact) and unfortunately can mean an extra 60-80 hours of work per hectare. But it remains very effective. Another technique is that is gaining in popularity is ‘Minimalschnitt’ trellising. This is basically a variation of the Australian bush-vine technique, though it is mainly used in Germany as a conversion from cane-pruned trellising. For the most part, it is used for Bulk-wine production as a cost-saving measure (you can save 70-80 hours/ha in winter pruning and it is easily machine-harvested), but it can also be employed for top-quality wines (though the bunches can be very difficult to find in the foliage and hand-harvesting can exceed 200 hours per hectare!) The other advantages of this system are the production of small, loose-clusters with higher acidity and lower Oechsle (10 degrees less is easily achievable all other things being equal.) Disadvantages are a reduction in yield per vine, and the need for a very careful and thorough spray-program (Oidium can be especially problematic due to the reduced air-flow, but the smaller, looser clusters can be an advantage if you are diligent.) There will also be a greater reduction in yield per hectare owing to the removal of every 2nd row of vines (in order to allow for enough space for plowing and sunlight between the rows.) We have several parcels that are biodynamically farmed using this technique, and besides the hand-harvesting (! ), it has proved excellent in every way –even disease control. Both of these techniques can be used in conjunction with cover-crops to help control vine vigor and give competition for water and nutrient uptake. Another method to help keep Oechsle in check is converting to organic viticulture or at the very least, to GREATLY limit the available nitrogen in the soil. This can be achieved by planting cover-crops to keep the soil cool but still well-aerated, discontinuing chemical fertilizers and limiting plowing after flowering. Nitrogen serves to keep the engine of growth running. With lower nitrogen uptake (especially late in the season), the vine is eased into dormancy producing riper wood, riper seeds, aromatically superior fruit with lower Oechsle at an earlier stage. The main problem is that some of these techniques are going to be harder to implement in the Mosel. Wire-trellising is becoming more popular there of course in all but the steepest vineyards, but asking Moselaners to add another 80-200 hours of work per hectare for the production of a lighter Kabinett (which most people would like to find for less than $20/btl.) isn’t probably all that realistic. It would also make sense to see the resurrection of some of the side-valley and Obermosel sites as a means to produce more delicate Riesling. Thanks for replying, Bill. I appreciate your answering Andrew’s question on Saumagen and explaining a couple of trellising techniques to help lower must weights. You bring up another important point, especially in regard to the steep slate slopes along the Mosel. The wines should be more expensive for the amount of hard work. Gernot Kollmann of Immich-Batterieberg said that growers need to cover the cost of production, especially those who farm old, ungrafted, and low-yielding vines and who can only do the work by hand—i.e., steep slopes with no remodeling (Flurbereinigung). He says that 20 euros a bottle is necessary. Some wines sell for under 5 euros, especially to merchants and importers, who like to keep the prices down. Today, more producers are recultivating forgotten and highly rated side valley sites (Wintricher Geierslay) as well as cooler upper sections of steep slopes rising up from the banks of the Mosel River. Of course, the Upper Mosel (Obermosel) has a different soil type than the Middle Mosel, Saar, and Ruwer. On a side note, I read that Pfalz wines were used to boost the ripeness of sour Mosel wines in the 1950s and 1960s. Thanks for your myriad insights, Bill! The labor-intensive technique of wrapping rather than top-hedging was as you may know originally brought to prominence by Lalou Bize-Leroy in Burgundy. (And it almost goes without saying that anything she starts doing makes the rounds!) I’ve talked to growers in many parts of the world who are convinced it is helping them brake sugars. One can understand why Germany is one of many regions where knee-jerk and aggressive hedging remains a default position for a high percentage of growers since ventilation is critical. Of course, one doesn’t want to have too high a ratio of leaf to fruit as that will only drive Oechsle, but as many growers have emphatically suggested to me (and I won’t attempt to go into details on which you’re no doubt much more savvy, Bill) not all leaves function in the same way. There seems to be a significant amount of work going on involving adapting pruning to brake sugars, for instance that which Greg LaFolette is undertaking, principally with Pinot Noir in Sonoma, is based on some quite sophisticated research he’s done into the vine’s metabolic triggering mechanisms. And I also hear from growers about the significance of pruning in terms of the sheer amount of cane or wood left on the vine, claiming that the more length there is for sap to be stored, the more sugar will be produced sooner. (I hear this though more often in warmer climes than Germany’s.) I imagine that “Minimalschnitt” could mean different things to different growers. I can, in a related matter, report that the 10.5-11% alcohol rosé and red wines which Abbatucci in Corsica has begun harvesting from vines he leaves essentially un-pruned to revisit their riparian roots taste remarkable and not at all deficient in ripeness (though let’s see how the vines are affected going forward, assuming he does this every year). Many readers may already be aware of this, but a very sizeable percentage of those growers who over recent years have converted or are in conversion to biodynamic viticulture (I’d estimate at least 25% of those I quiz in Europe and North America) claim to be strongly influenced by a believe that this will brake sugars while promoting ripeness of flavor. Of course, site selection is a hugely significant factor and growers are increasingly seeking out sites that might have formerly been neglected but now hold out the promise of ripe flavors at lower sugar levels. I have devoted several columns and/or articles to this topic over the years in The World of Fine Wine, Vinaria, and Wine & Spirits (apologies for the shameless plug ;- ), including discussions of instances – prominently among them Johannes Leitz with his Berg Kaisersteinfels and Toni Bodenstein with his Vorderseiber a.k.a. Wachstum Toni Bodenstein – where daring high-elevation projects were not in fact begun with thoughts of adapting to climate change and permitting lower-alcohol results but to some extent had that result. The examples I have recently been repeating again and again to other growers and to those who ask about the latest evolution of German Riesling vineyards as regards reactions to increased Oechsle come from the Mittelrhein. It was especially evident in 2011 that the top Bacharach growers – Ratzenberger, Jost, and Kauer (the last-named, as some will know, a professor at Geisenheim specializing in organic and biodynamic viticulture) – were only able to bottle some genuinely light (Kabinett or Kabinett-styled) Rieslings thanks to the fact that all of them have been expanding their acreage or contracts to include vineyards at higher-elevation and/or in side valleys, especially in next-door Oberdiebach, a village that a decade or so ago looked slated to become yet another in the Mittelrhein where viticulture would die-out. Riesling in the good sites of Bacharach and Steeg (even though the latter in effect also a bit of a side valley) didn’t ripen before reaching far into the 90s in Oechsle, meaning that dry-tasting wines of less than upper-12s in alcohol weren’t in the cards. Before I forget again, I remember on a visit at Zind-Humbrecht several years ago that Olivier Humbrecht discussed with us how he doesn’t cut off the shoot tips. Roman Niewodniczanski at Van Volxem says that the Saar has benefited from climate change. Nonetheless, it’s a worrisome trend, even on the Saar. In recent vintages, many Saar growers are picking grapes mostly above 90° Oechsle. In the Ruwer Valley, Carl von Schubert of Maximin Grünhaus harvested in 2011 no grapes under 89° Oechsle. Great article Lars and some great replies to this thread as well. Can you mention any good kabinett vintages? Thank you, Kjetil! Do you mean recent vintages? If so, I would think 2008, even though many of the Riesling grapes exceeded the minimum must weight for Spätlese. I’m sure David Schildknecht or someone else can give us his or her opinion. Erich Weber of Hofgut Falkenstein, on the one hand, says that 2012 will be his first vintage in years in which he makes some Riesling Kabinett trocken. On the other hand, Katharina Prüm of J.J. Prüm says it will be a Spätlese and Auslese vintage. It depends on the district, the vineyard area, and the grower. Yes, sorry I wasn’t clear about that, but what I meant was any vintages worth mentioning from 1995 and up until today. I prefer Kabinetts from Mosel and those who don’t exceed 45 g/l RS. One of my favorites is the 1995 Scharzhofberger Kabinett from Egon Müller. But I’ve also had an impressive 2000 Scharzhofberger Kabinett from Van Volxem, which was a difficult year. I think there are a number of vintages worth mentioning, even if ripeness levels are higher nowadays. In addition, it’s difficult to generalize. I’ve had great Kabinetts, including dry and off-dry, from riper vintages. It depends on the grower and the site. Perhaps others can reply to your question. First let me mention that when I started in the trade in the late ’70s and the ’80s “Kabinettjahrgang” had a specific meaning among German growers, designating a vintage in which the prevailing category of wine, by Prädikat, was Kabinett. And bear in mind that this wasn’t considered pejorative; on the contrary, in the longer scheme of things one was happy to get such a vintage! So, in that sense we haven’t had more than one Kabinettjahrgang since 1986, 1987 having been a bit too challenging for more than a minority of wines from top estates to have been left unchaptalized (though both many 1987 Q.b.A.s and those Kabinetts and few Spätlesen there were, were delightful then and in some instances still now) and 1988 beginning the streak of ripe vintages that we could at most say was broken by a “Kabinettjahr” in 1991 (a vintage I love for its relatively rare upper-Prädikat wines as well as its many Q.b.A.s and Kabinetts). The most difficult vintages between 1988 and 2010 have otherwise been those like 2000 and 2006 where high ripeness (due to its coming early and with rain) was a big part of the problem! Even when it comes to 2010, must weights are far too high on the whole (again, I’m thinking of conditions prevailing among the top growers) to call it a “Kabinett year” – at least in the traditional sense. I’m glad to have your expertise, David. I didn’t even think about “Kabinettjahrgang.” As always, you make some very good points. I also like the 2002 vintage, especially some of the wines from Ulli Stein. You’re right about 2004 and 2008, too. The top producers, such as Selbach-Oster or Emrich-Schönleber, like to pull out these vintages for tasting, as the wines are brisk. I’d like to add, as an addendum to my two-part piece, one point about must weights. Most top winemakers first taste the grapes, then the must, and later the young wine in order to determine if it’s a Kabinett rather than just look at the legally minimum must weight for this Prädikat (up from 70° to a still-low 73° Oechsle in the Mosel). In other words, a Mosel Kabinett, or Kabinett-style wine, can have 88° or so Oechsle and still taste light. this is a fascinating article about key issues of making wine in Germany. I have read it already twice and will continue to re-read it. There is so much information and useful analysis in it! Congratulations for a job very well done. In the discussion, however, one should not forget that Germany – and in particular the Mosel Valley- is a wine producer at the margin of the wine making belts in the world. German Spaetlese/Late Harvest grapes achieve a sugar level that is by international standards merely just ripe rather than late harvested. The great dry white wines of the world tend to be harvested at sugar levels exceeding the German Spaetlese range. And yet, they are bone dry. Why the great Bourgogne producers, for example, have no problem in making ultra premium dry white wines with their grapes, while their colleagues up in the cool climate Mosel region should have a problem to fully ferment their wines, if they wish to do so, escapes me. Of course, light, sweet-style Mosel wines are delicious and a German speciality sought for all over the world. But they are not a product of Mother Nature. They would not exist without the skillfull intervention of the winemaker, like so many other wines in the world. Today, I spoke with one of the top Mosel winemakers who knows Burgundy well. He says that Burgundians do have occasional problems with fermenting wines dry if they use ambient yeasts. The main reasons, he says, why Mosel Riesling doesn’t always ferment dry is the often cool harvest weather combined with the cold cellars and fermentation with native yeasts. Thanks. Interesting. But it is not just Burgundy. When you go to a wine bar anywere in the world – New York, Paris, London, Berlin, Sydney – and you order any white wine from anywhere in the world – Italy, Spain, France, Australia, California – you can be assured to get a bone dry white wine. All over the world, wine makers fully ferment their wines – except in Germany. Alsace is also an interesting case, where the wines used to be bone dry, but now, more and more Alsatian wines have a noticable remaining sugar level. But this is not driven by Mother Nature. It is driven by the market and accomplished by the wine maker. You’re welcome. Yet you keep insisting that it’s only market-driven and done by the winemaker. As I point out under “Fermentation,” some winemakers have problems to get certain wines to ferment dry. Like everything significant that impinges on wine, there are aspects of residual sugar contributed by nature and aspects contributed by the vintner. That German Rieslings often fail to ferment fully without some assistance is something one finds observed in the historical literature or can directly experience even with wonderful old wines from places like Kloster Eberbach. And bear in mind, old Rieslings there that left behind small amounts of residual sugar had typically spent 2-3 years in cask, so it’s pretty clear that this last bit of residual sugar didn’t “want” to ferment-out! Let’s abstract completely from the relatively recent tradition of really high-residual sugar Mosel Riesling and focus instead on wines that left-behind, say, fifteen or fewer grams. And let’s also stipulate that we are talking about musts of 10-14% potential alcohol, in other words not especially rich musts such as might result from late harvest, advanced botrytis, or an extreme vintage. Bear in mind, when one talks about “German Riesling trocken” nowadays one is talking about wines that fit a legally operative definition that permits as many as 9.9 grams (provided the acidity is correspondingly high). So even among “dry” (i.e. legally trocken) German Rieslings, we know that not just many of them but in fact most of them harbor levels of residual sugar that a grower in Chablis or the Côte d’Or would consider to be inappropriate and in fact a big headache. So there’s a difference here, Christian. Well, as I suggested, there is almost certainly some “natural” aspect to this. Even within Germany, we don’t regularly find, say, Sylvaner or Chasselas fermentations petering-out with residual sugar any more than we do Chardonnay in Burgundy. But Chenin in Vouvray, Montlouis or Jasnières? Yes: there, typically, some of one’s barrels will ferment fully but often some hang-up. So there seems to be a proclivity of certain cépages in certain places to get hung-up before entirely completing fermentation. That this could in particular be a proclivity of Riesling as a cépage is suggested by the fact that it happens with wines from vines in quite a range of soils treated to quite a range of different cellar regimens. Of course there are important human aspects involved. If you ferment with cultured yeasts some are more aggressive or reliable at achieving complete dryness than are others and it’s your choice as vintner. On the other hand, if you let your wines ferment spontaneously … well, the differences from one place to another and the roles of different so-called “wild” yeasts are an area subjected in recent years to a lot of speculation but also some scientific study, so while we don’t know a lot (and it’s virtually certain that most people don’t know what they’re talking about ;- )it is quite possible that yeast populations in, say, Mosel vineyards and cellars tend less-often to bring a must to complete fermentation, which I would (not that we’re keeping score)be more inclined to chalk-up to Nature than to Man. If you take a look at the routine practices of German vintners today in the production of legally trocken Rieslings (and again, bear in mind that here we’re often talking about just getting them down under 8, 9 or 10 grams) we see that many times such wines are allowed to ferment spontaneously up to a certain point but then ferment peters-out and the grower adds some cultured yeasts to get past the trocken finishing-line. Another thing many growers do is warm the cellar to encourage a more complete fermentation. One sees that in Burgundy too – routinely for encouraging malo, but in reality when the barrels get moved to a warmer part of the cellar or tented with plastic tarp and joined by a space heater, many of them often have some sugar still left as well. Finally, if you examine the records of many a German trocken Riesling you’ll find it represents a marriage of casks some of which were themselves legally trocken, and some of which weren’t. So, the grower did the blending but didn’t necessarily do anything to bring about some of these casks stopping with more than ten grams of residual sugar. It would be more accurate to say that the grower did nothing to encourage or force his or her casks of young Riesling to go dry, and under those conditions, some of them “naturally” didn’t. I have been appreciating here in Washington DC the always extremely informative elabarations of David since he was working in the Washington DC wine industry almost 30 years ago. In those years, at the German Wine Society (DC Chapter), we had the privilege to be able to taste with him German wines and listen to him on a regular basis. These were always memorable evenings. A bit more than 2 years ago I was able to listen to his lecture “Riesling’s Gobal Triumph: A Pyrrhic Vistory? – Rieslings globaler Triumph: Ein Pyrrhussieg?” at the 1. International Riesling Symposium in Hattenheim. David spoke in English and distributed a German version in printed form. The German version was then re-issued https://schiller-wine.blogspot.com/2010/11/david-schildknecht-rieslings-gobal.html on schiller-wine. For all who understand German …. eine sehr interessante Lektuere. David Schildknecht’s replies are always instructive. His last one should be a separate article. I’ll refer to it in future posts. Thanks for the link to David’s lecture, Christian. Today, Reinhard Löwenstein informed me that VDP members can only bottle a wine as Kabinett with a minimum of 18 grams of sugar per liter. I didn’t know this. I’m also uncertain if the members can put “feinherb” on the label for Kabinetts near this lower limit, because there’s a big difference between 18 and a maximum of 65 grams. This, however, means that Rieslings under 18 grams cannot be labeled as Kabinett. Will members then worry to keep certain Rieslings above this arbitrary marker in order to be labeled “Kabinett”? And how can they highlight a light, dry Riesling, much less one from a Grosse Lage if they already make a GG from the same site? doesn’t that imply that there will be no wines with remaining sugar from 8,9,10 g/l and 18 g/l? Because if you want to sell it as (sweet-style) predicate wine, it has to have at least 18 g/l. Alternativly, you can sell the wine in your dry selection but then it has to be below 8,9,10 g/l RS. Yesterday, I asked Florian Lauer. The VDP does allow members to apply for exceptions. For example, a member can request to make a Kabinett trocken. I don’t know about halbtrocken. Yet the VDP wants a Kabinett to be between 18 and 65 grams of sugar per liter. Among Grosser Ring (VDP Mosel-Saar-Ruwer) members, most of them produce sweet Kabinetts anyway. The worrying and – to me, anyway, irksome – apparent plan (about which I knew nothing until I read it here) to institute among Mosel VDP members a lower bound to residual sugar for “Kabinett” is (alas) quite consistent with overall VDP politics as well as widespread insistence (in my view unfounded and prejudicial) that alcoholic levity is a sign of weak raw material and inappropriate stylisitic choice unless your Riesling happens to be grown on the Mosel (or perhaps also the Saar, Ruwer, or Nahe), and then only if the wine is unabashedly sweet. I have sympathy with those who think the best thing for consumers is to narrow the significance of the so-called Prädikat terms to a certain band of sweetness. But “Kabinett” doesn’t function and never has functioned in anything much like the manner of the other so-called Prädikats. Instead, it was designed to put a sort of floor (and then a sagging, weak one) on must weights of unchaptalized wines. What’s more, unlike the other so-called Prädikats, it has no traditional usage as – nor any precursor that was used as – a description of harvest conditions or to allude to degree of ripeness. Rather, as Lars’ article explains in detail, “Cabinet” was a purely approbative term for any wine a grower deemed especially fine. Thus, “Kabinett” as defined by the 1971 German Wine Law has always served as a sort of conceptual empty-vessel used in very different ways depending on grower and region, the most common common denominators typically being as a means of calling attention to the fact that the wine in question wasn’t chaptalized, and/or as a means of calling attention to its relative levity. My conviction is that perpetuating the use of “Kabinett” in the latter sense could prove a useful marketing tool for those growers who remain interested in dispensing vinous levity, whose virtues are clearing dawning on a growing number of wine lovers. The Austrians – even though they once did – will never go back to using “Kabinett” in that way because it’s too tarnished with the “Germanic” – therefore NON-French, therefore bad – image of which I just wrote. But this leaves those outside of the Wachau (which has its own well-known and evocatively-named stylistic categories) forced to simply refer to a wine of relatively lower alcohol as “non-Reserve” – a charmless, colorless, indeed uninviting description if ever there were one (you might as well just say “read the fine print on the label”) – which only underscores the potential benefit of salvaging “Kabinett” to call attention to alcoholic levity, at least among growers of German Riesling. * I hope I can be forgiven this shameless plug. (Otherwise Lars can pull the plug ; -) But I also need to mention that the link in question always leads to my most recent Vinaria column, so in around eight weeks it will no longer take you to the column whose subject I discuss here. In Karl Heinrich Koch’s Rheingauer Rheinfahrt (von Zabern, 1908), he says “Rheingau is the home of Kabinett wines.” In the past, Koch explains, a Kabinett wine was “usually the outstanding Auslesen.” Yet no one knew what qualified as Kabinett. In the “modern era,” the Prussian domains started to label auctioned wines “Kabinett” that reached a certain price and were bottled in their cellar. Thanks to Per Linder, who contributed “Mosel Wine in Sweden,” for pointing out this passage. Just perusing this thread again. Anyway, I do recall reading somewhere that ‘Cabinet’ was originally a Rheingau concept. I am curious how much it was used in other regions prior to 1971. To clarify – after Schoonmaker’s day, was ‘Cabinet’ used much in the M-S-R; or ever in the Pfalz? In Frank Schoonmaker’s Wines of Germany (first edition), he explains that Cabinet was seldom used either in the Mosel or Pfalz. Looking at even older German wine books and journals from the 19th century, I’ve only come across references to Cabinet for Rheingau wines—in particular, from Steinberg and Schloss Johannisberg. Yes, “Cabinet” was originally a Rheingau term. The region belonged to the Duchy of Nassau in the early 19th century, when Cabinet was first listed on labels of Steinberger. David Schildknecht says in the “Origin of Kabinett” that Loeb & Prittie’s Moselle is mistaken. Before 1971, the term was found in other regions beyond Rheingau. Frank Schoonmaker says that Cabinet was also “frequently” used, for instance, in the Nahe region. First, the word Kabinett (or Cabinet or Kabinettwein). Orginally wines so marked constituted a sort of private reserve of the vineyard owner, and in some cases were not offered for general public sale. The term originated in the Rheingau, and purists insist that properly it should not be used on any except Rheingau wines. To my knowledge, it has never been used in the Pfalz, rarely in Hessia (although frequently on the Nahe), and only one or two major producers of the Moselle, and then only on bottles destined for export. Legally, the term has no standing and may be given by any producer to any wines he sees fit; in practice, however, among the great vineyard-owners of the Rhine, it has a very precise meaning, albeit one which varies from one vineyard-owner to another. At the State Domain (Steinberg, etc.) as at Schloss Vollrads and Schloss Reinhartshausen, Kabinett wines are all those that sell for over a ceratin fixed price per cask; this minimum varies considerably from one producer to another, and even occasionally from year to year. At Schloss Johannisberg the system is quite different, and a fuller explanation will be found in Chapter IV. Briefly and in general, Kabinett wine is a superior grade, though certainly not a rarity—all Auslesen, and almost always all Spätlesen, have Kabinett rank, and in years such as 1953 so do many other wines of less distinguished origin but superior quality. Also, keep in mind that he wrote his first edition in the 1950s and is referring to the early- to mid-20th century. This was both different from the late 19th century and from the 1950s and 1960s when sterile filtration began to be used more among small growers. The problem with the VDP is that there are different regions and producers trying to create one classification system for all its members. This entails a lot of political maneuvering. I understood that Diel was one of the early big backers of GG. In the beginning, the VDP’s model looked more like a Bordeaux classification, rather than one based on the Burgundy model. Moreover, producers such as Dönnhoff or Karthäuserhof didn’t like that they had to rename their light, dry Kabinetts without the vineyard name or the Prädikat. It’s ironic that the VDP hypes a dry German Riesling, which must be under 9 grams and can be chaptalized (not that I’m against chaptalization). But this has little to do with the tradition of the German Natural Wine Auctioneers. Back then, many of the best wines were off-dry Auslesen. Apropos Kabinett, I just posted a reply to another article, which also applies to this thread. I’ll repost it below. Martin Kössler of K&U, arguably the top wine merchant in Germany, still selects a Grünhäuser by the Fuder. Last year, from a smaller cask, he chose a 2012 Maximin Grünhäuser Herrenberg Faß N°17. It’s a special K&U edition. He says that Herrenberg seems to be his favorite. The Oechsle was about 84 degrees and the wine tastes dry, despite the 21.7 grams of sugar per liter. He feels that it’s a real Kabinett in the tradition of Naturwein—i.e. before the wines started to become overly sweet. At a recent lecture from Dr. Daniel Deckers, he says that Schloss Vollards was the first producer to use the term “Cabinet,” not Schloss Johannisberger or Steinberger. On Egon Müller’s website, which is difficult to navigate (though I like the photos by Andreas Durst), Müller writes a very good point about how he defines Kabinett. It’s written on the backside of a photo of a 2009 Scharzhofberger Kabinett. Müller told me the same on a visit to his estate with David Schildknecht last year—namely, Kabinett is not necessarily about a low must weight for him. The grapes shouldn’t be over-ripe, but so much depends on the vintage and the notion of naturrein, or naturally pure—i.e., no sugaring or additives. A few years ago, his Singapore importer requested that the Scharzhofberger Kabinett wines should have less residual sugar. Now, these bottlings tend to be under 50 grams of sugar per liter. According to Florian Lauer, the new VDP Mosel range for Kabinett is 18 to 60 grams of sugar, or for Kabinett feinherb 18 to 30 grams. This applies to Grosse Lagen and Ortsweine. As per the latest VDP stricture, a Kabinett from a VDP.Grosse Lage should have 85 degrees Oechsle, less than 10% alcohol, and at least 20 g/l RS.